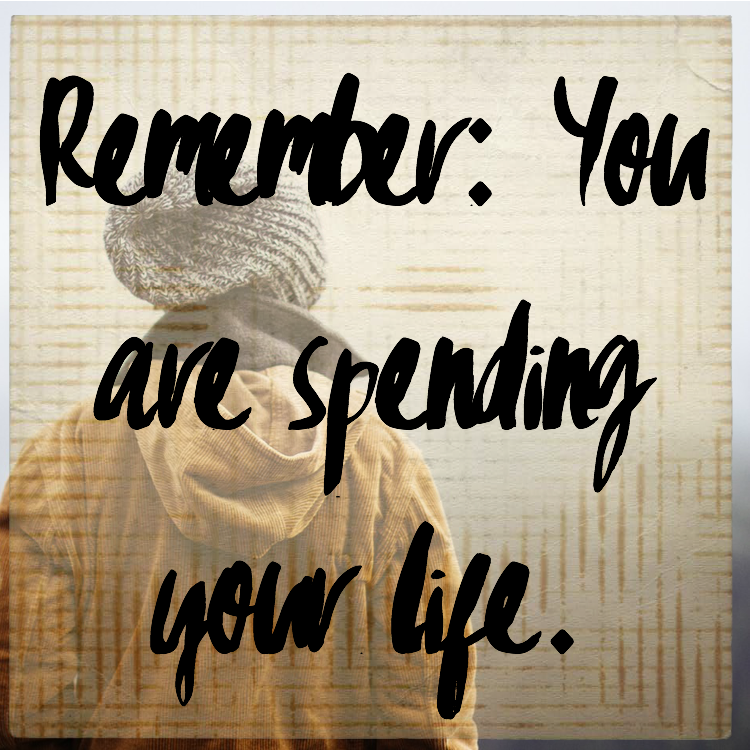 Remember: You are Spending Your Life. | The girl who loved to write about life. At the start of every month, I share a monthly to-do list called Spending Your Month. It's my way of remembering that we get to spend our lives. One thing I keep hearing about having a baby is that "The days are long, but the years fly by." I can't help but think this is true in most areas of life. We all of seasons that feel never-ending, weeks where we wish the universe would just cut us a break already, months where no matter how hard we try, we just can't seem to make ourselves believe that life is good. But then once those seasons are over, we comment on how time is flying by, how we've grown so old out of nowhere. This summer seemed to last forever. I was so sick for most of it, Chris was working all the time, and it just wasn't full of the things I love about summer. It seemed like the never-ending season of meh, and I was pretty sure that I was going to be stuck at 3 months pregnant, throwing up everything I ate, while home alone forever. But at the same time, where did the summer even go? Because now we're in the last week of September, and this baby will be here in just a little over three months. Time passes at the rate it passes. No matter how badly we may want to reach out and freeze some moments forever, or use a fast-forward pass and skip over some moments, we can't change the rate at which time moves. What we can do, though, is choose how to spend it. We really have to remember that we are spending our lives. Whether it feels like it or not. No matter how much free time you have or how much of a choice it feels like you have about your life, you're still spending it. From what you do on your commute to work, to your lunch break, to before bed, to your day off...whatever you do, you're spending your life. And you're choosing how to spend it. Whether you're making good choices or not, they're still your choices about how to spend however much of life you may have left. So with that in mind, let's spend our lives for good things this week. Let's spend it on the things that make us happy. On things that are productive and will make our future-selves thank us. Let's spend it on the things that matter and on the silly things that don't matter at all. Let's spend it working on what's important, and relaxing with people who are even more important. Let's spend it on the things that make us feel alive. Most importantly, let's just remember that we are spending it. So stop and get a milkshake on your way home from work. Wake up a little early so you can watch the sunrise. Write a letter. Binge-watch your favorite show. Buy some flowers. It's your life. So spend it, and spend it well. I absolutely love this! It's so each to get caught up in wishing a season or a day could pass and not appreciate life fully. So true. I remember those months leading up to Match Day where time felt like it was creeping by. Now I can't believe we have been in Chicago for three months! This really touched my heart today. I just turned 25 this month, which has me thinking about how I've spent my life. I know spending your life well is part time management, part stress management, and part "making good choices." It's easier said than done, but it's so important. Thanks for this beautiful reminder! This lesson has been really major for my husband and I. I so badly want this season of infertility to be over but at the same time I don't want to look back on my 20s and feel regret we didn't enjoy it more. It's a daily choice for sure. Such an important reminder and I totally needed this today so thank you for sharing. It's a good reminder to stop and think, is this how i want to spend my life? Love this post! I try and practice this as much as I can, but the planner in me has a hard time with it. Plus with my husband deploying, I always find myself either looking forward to his coming home or dreading the next time he leaves. I may just print out your image and pin it up in my office as a reminder! you know what? I really needed to read this today. thank you so much! You always put things into such a good perspective. When thinking of what I want to do with my life, I feel like all the socially accepted plausible options are just ways for me to waste time away. All this time spent studying could be spent on something else. Or maybe this is all I know, and having this purpose really is the best way to spend my time. I absolutely love this post! I like the way you think about "spending your life." I think that's such an interesting way to think about time, how we choose to spend it, and what we really want out of life. Tonight I'm going to go out with husband out for dinner, just because! Every day I work I BEG in my head for it to be over. I literally waste 5 days wishing it was my days off. And then my days off go so fast. I have to quit wasting my days, even if I am at work.